Opposite here. This year was very upsetting because my whole family, minus my 11 year old, forgot me and ignored me. My husband never said a word . In our 21 years of marriage, I have always made it a point to spoil him. Aww, that’s so discouraging and I’m sorry to hear this. God bless you for loving your husband and spoiling him on his special day. You are doing right to treat him well and honor him. I agree with you Laura….. everywhere around here announced that Mother’s ate free on Mothers. 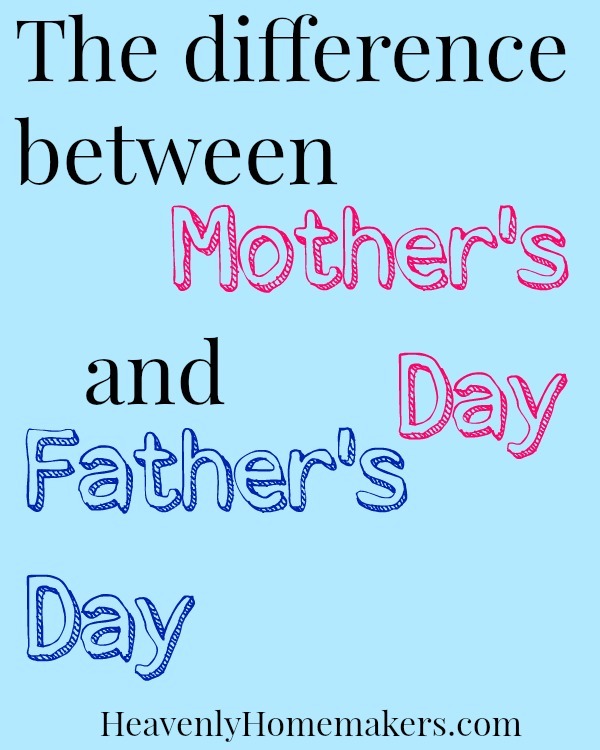 Day…..but I didn’t see any last year for Father’s Day and so far this year either……not fair at all Restaurant owners…………. Since we are “fatherless” this Father’s Day due to alcohol and all sorts of abuse and will be ever after, I told my daughters that I should get a second day! I do the work! They agreed! Maybe there’s just a consensus that Mom’s are usually ignored in all their hard work and dads get praised all through the year (mostly by their hardworking wives!) I know this is not true in all families, and certainly not the Christian ideal, but I’ve seen it happen many times. A sad commentary. My husband’s and my gifts to each other on mother’s/father’s day are always time to ourselves at home WITHOUT kids. Usually, I take the kids to my Dad’s house to spend time with him. Plus, since I am the chef, I make ice cream cake and one of my husband’s favorite meals for dinner.